Washougal is found on the East of Vancouver at the banks of the Columbia River. It is popularly known as the “Gateway to the Gorge” both to its inhabitants and tourists. The name was derived from a tributary river flowing into the Columbia. This Chinook dialect means “rushing water”. This is considered as one of the more ancient areas in the region. Early accounts show that it has existed from the birth of the Chinook tribe. Currently, the town has a population of approximately 13,000 and is considered a suburb of the metropolitan portion of Portland, OR. Notwithstanding, the area is still renowned for its semi-rural landscapes. The Washougal River is a perfect place for water sports as well as nature photography. It offers exciting opportunities for outdoor adventure. The Gateway to the Gorge’s community Library and community center can be found inside the City Hall complex. Their librarians were recognized and awarded by ALTRUSA with the International Library Service Award in the year 2002. Washougal is also located near the Portland International airport which is considered as the major airline for both international and domestic flights. One of the best things about Washougal is that it has a lower property tax rate for real estate sales transactions. Its property tax rate is pegged at $14.22 per $10,000. 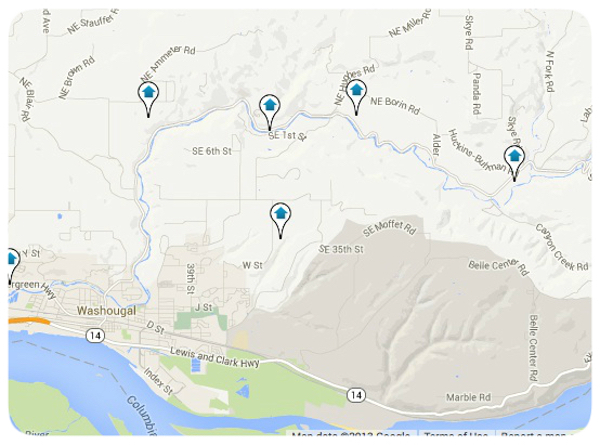 This is just another reason to take a closer look at homes in Washougal.